Chartered on January 6, 1893, I.B.E.W. Local No. 7 of Springfield, Massachusetts, commemorated its 125th Anniversary with a Festival and Clambake — the local has held an annual clambake since 1926— on September 8, 2018, at the Ludlow Fish and Game Club in Ludlow, Massachusetts. 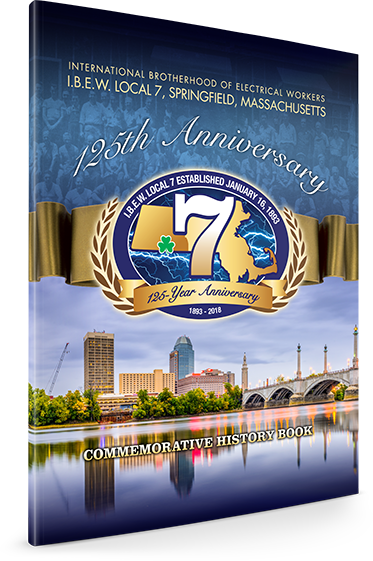 For the local’s special anniversary, Union Histories produced a fully researched, full-color, 125-year keepsake History Book of Local 7’s amazing story (did you know, for instance, that Local 7 installed the world’s first continuous fluorescent lighting system in the Springfield Armory during World War II? ), and Union Histories also produced special signage and a video slideshow for the celebration festivities … all at NO COST to Local 7!